Gene is different from everyone else around him. He can’t run with lightning speed, sunlight doesn’t hurt him and he doesn’t have an unquenchable lust for blood. Gene is a human, and he knows the rules. Keep the truth a secret. It’s the only way to stay alive in a world of night—a world where humans are considered a delicacy and hunted for their blood. 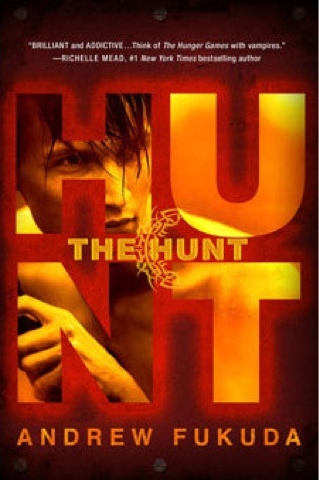 When he’s chosen for a once in a lifetime opportunity to hunt the last remaining humans, Gene’s carefully constructed life begins to crumble around him. He’s thrust into the path of a girl who makes him feel things he never thought possible—and into a ruthless pack of hunters whose suspicions about his true nature are growing. Now that Gene has finally found something worth fighting for, his need to survive is stronger than ever—but is it worth the cost of his humanity? The following review is based solely upon vampire books that are full blown blood sucking vampire books. Not books where the vampires are side characters. Like Harry Potter or Hex Hall. Do you get what I'm trying to say? Fact: I never read Twilight because there were vampires in it. Fact: The only vampire I've ever loved is Jenna from Hex Hall. Fact: I'm not sure why I bought this book. Opinion: This book was one of he more surprising books I've read. Opinion: I was definitely surprised by it. Opinion: this book was no exception. So if you can't tell I'm not a big fan of vampires. They've always reminded me of giant leeches. And to me that is more gross than scary. So I have absolutely no clue as to why I chose to read this book. Part of it probably was because it was the kindle daily deal and I really like cheap books. The other part was the sample I had read. Fact: The sample was extremely compelling. I think what drew me in was the author's writing style. It was blunt and to the point and yet at the same time I found it to be haunting and mysterious. Throughout the book that was what kept me going. So one of my biggest problems with the book is that it was not what I was expecting. I was expecting Gene (whose name I didn't even know until over half way through the book) and his vampire buddies (they will always leeches in my mind) to go off hunting humans. I thought they were going to be out there and that Gene was going to keep doing things to protect them. For most of the book the wandered around muttering about how that wanted to eat the "hepers" there word for human. And also that Gene was one smelly boy. Can you say yuck? So for me that was a let down. Also it felt so Hungergamish.... Just with vampires...... Seriously whole book I felt like it was so similar to hunger games. Like whoever eats the most humans wins, and then how they wanted to form strong alliances. They were the stars of their world and EVERYONE wanted a piece of them. Sound similar? I'm not saying it was a rip off because it was totally original.... It just made me wonder. Gene was so full o self loathing. He kept going on about how shameful it felt being a human. Blah blah blah. I take offends to this! I mean sure sometimes people may doubt me. They may think that I'm from mars. (Which I have claimed that is where I originated from) but no matter where I'm from I am human at heart and I take offense. Several times I was so close to yelling at my kindle: Gene, humans are good! I love my species. Screw you if you want to be a vampire. I get that in Gene's world being human is hard. But seriously there is no need to go into self loathing and state you hate humanity. I wasn't feeling it. At all. This is hard to write without putting in spoilers but he whole book I kept thinking, dude she is going to get you. She is going to kill you. You might end up crying. And Ben all of a sudden they were like I LOVE YOU!! You are the only thing in this world worth living for. Fact: Gene knew where to find apples. Fact: I personally think apples are a far better reason to live. Do you see what I'm saying? It was insta-love. Some may argue this and tell me. No there relationship developed over time. Then they fell in love. Fact: They knew each other at school and had the vampire equivalent of a kiss. They enjoyed watching each other. Then the next day they admit their love for each other. So for the whole book I really thought it was okay, I was going to give it a solid three stars. But then there was the ending... And wow. It was action packed fun and surprising. I seriously feel clueless. I mean how did I not see that last sentence coming. I always see the twists and the turns. They are normally fairly obvious. But I was totally clueless when it came to that ending. I was wowed. Making me give the book an extra half star because yes, I was that impressed! Did I love this book? No. Did I hate it? No. Was I basically just indifferent? Yes. I think that this book has helped me to establish that me and vampire books just don't click. I also think that there were several flaws in the book that hindered my enjoyment. FACT: I MIGHT BUY THIS BOOK.... IF IT IS SEMI CHEAP. FACT:I PROBABLY WOULD NOT CHOSE TO PICK UP THIS BOOK AGAIN. FACT: I PROBABLY WOULD NOT RECOMMEND THIS BOOK TO MANY. UNLESS THEY LOVE VAMPIRES.. A LOT. FACT: I DON'T THINK I WILL BE PICKIG UP THE NEXT BOOK. FACT: BECAUSE I LOVED THE AUTHORS WRITING STYLE, I WILL READ MORE FROM HIM. That's a shame! I have this book to read but I never have because reviews are kind of meh. Though, having said that, I DO like vampires, so who knows. If you leave a comment, about anything really, you will make my day, maybe even my week if it's a really great comment! =D Anyhow I will try to respond and if you have a blog, leave me the link! I would love to check it out!! Put your e-mail below and you will have the pleasure of dealing with me (almost) daily!!!! Aberrant Book Blitz and Giveaway!!! SUMMER!! Why must you end! My thoughts on third person POV! I love animals. I love the color green. I love hiking, biking, skiing and running. I absolutly love reading. I live in the U.S. and I'll read practically all genres of Young adult and some Middle Grade. I'm a high school student and I LOVE MATH.